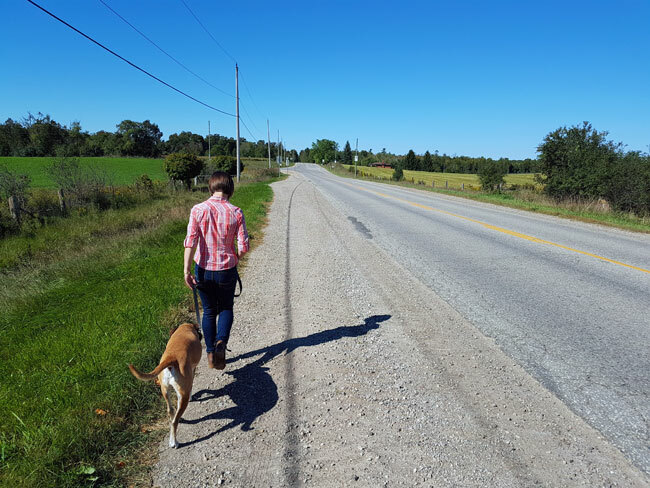 Baxter prefers walking on the road—maybe he finds the gravel uncomfortable on his feet—and he doesn’t comprehend that people will not yield to him (although many drivers do swing around us). When a car is coming, “over” is how we tell Baxter to move out of the traffic and stay safe. 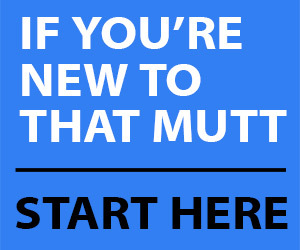 However, I realize I’ve not set Baxter up for success with this command. At its most basic, “over” means move onto the gravel as close to the grass and the ditch as you can. 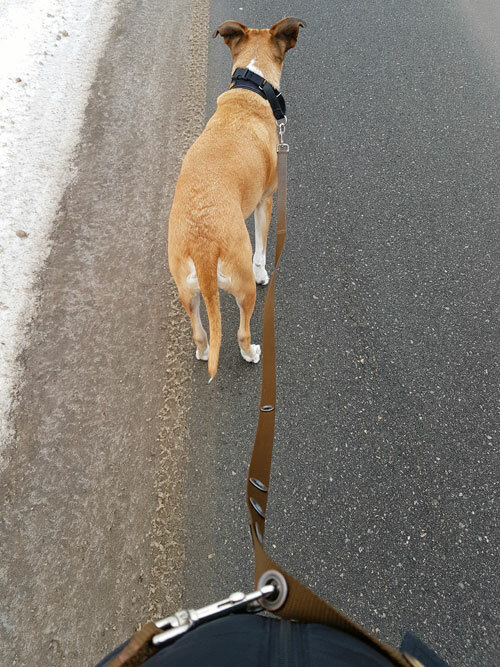 In my ideal scenario, “over” also means stay in front of me (Baxter’s usual walking position) and maintain your pace. We’ve gotten to the point that now when I say “over” Baxter’s reaction is often to stop walking or slow down and wait to be tucked behind me. Once he’s there, we walk very slowly, sometimes engaging in tug o’ war with the leash as he tries to step back out onto the road. This is very annoying—not to mention unsafe. I feel like Bax knows the command because he does it sometimes, but he’s too lazy or obstinate to obey all the time. And maybe that’s true. But I also feel like I’m not being fair to Bax. I can’t be frustrated that he’s not doing the behaviour that I want because I am not being consistent when I ask him to move “over.” Sometimes I move in front of him. Sometimes I don’t. My behaviour is not the same, so how can I expect his to be? To teach my ideal “over,” I have to break down the steps that I want, find a calm safe spot to practice, and slowly build until Bax does it reliably. Or, I accept that “over” means I shorten the leash, move in front of Bax, tuck him behind me, and we slow our pace. Most important, I have to be consistent in my actions when I give the command. Being thoughtful about the command and the behaviour I want has helped to decrease my frustration. I also think it’s helping with Baxter’s confusion (or obstinacy, if I’m being cynical). Does anyone else have problems with consistency in commands? How do you ensure you’re getting the response you want from your dog? Imagine how frustrated and lost would you feel if your school teachers were constantly changin facts and rules during their lessons – and we’re much more mentally adaptible than our four legged companions. Their learning process (associative learning) is different than ours so they need consistency to know what exactly is needed of them at what time othervise they just get confused or learn something that you didn’t intend to teach them. We’re lucky dogs are so tolerant of us! We must be so confusing! We’re an equally important part of the equation! I find that my 5 month old mix pup is rock solid in predictable situations, with a sit stay but as soon as there is another dog (or our neighbors cat) she breaks! Do I need to start with her right next to me in the driveway with the cat in the distance and then work my way forward from there? She wants that cat sooooo bad!!! You have it exactly right, Janis. Start very basic with no distractions and then work up to more complex environments. It takes practice for behaviours to translate to all situations. It sounds like you have a great start. Be patient and keep working! Yep, start by standing right next to her and praise/treat while she’s staying. My 9 month old rescued Lab cross seems to think that me holding his leash is an invitation to a game of “Chase me”. Its loads of fun (for him) not so much for me. I have tried starting with a sit command, even with Benny Bully it doesn’t seem to work. Also, I am using a Gentle Leader which he HATES. Any ideas? It takes some dogs a long time to accept wearing a gentle leader and most don’t like it. I use a treat for my dog and give command “nose in” when he wears his. He hates it, but he will wear it. He used to “buck around” with it on like a wild horse and I just ignored him and kept moving forward. If your dog doesn’t seem to be doing well with it, I would try a different option like a slip collar or martingale or a no pull harness. It’s nice to have a few options though and the Gentle Leader does work really well for a lot of dogs. I’m totally guilty of this too. Something to work on! Kind of very problematic, cause you know I don’t even know how to train my dog hahaha and it’s just that he always love to wander and explore and I kind want of locator or locate his location just you know in case. But this helps thanks a lot.